We, at Central Square Congregational Church, love that we have a facility that we can share with the community for so many different purposes, in addition to serving as a church home for our congregation. We have support groups, cub scouts, girl scouts, mom-and-child groups, a community choir, and so many more folks that regularly meet and/or host events in our building. In addition, we host the Bridgewater Food Pantry, serving many families in need each week. In recent years, however, we have found that, like everyone else, our operating costs continue to increase. To help solve this challenge, we have some engaged in some community-involved fundraising. 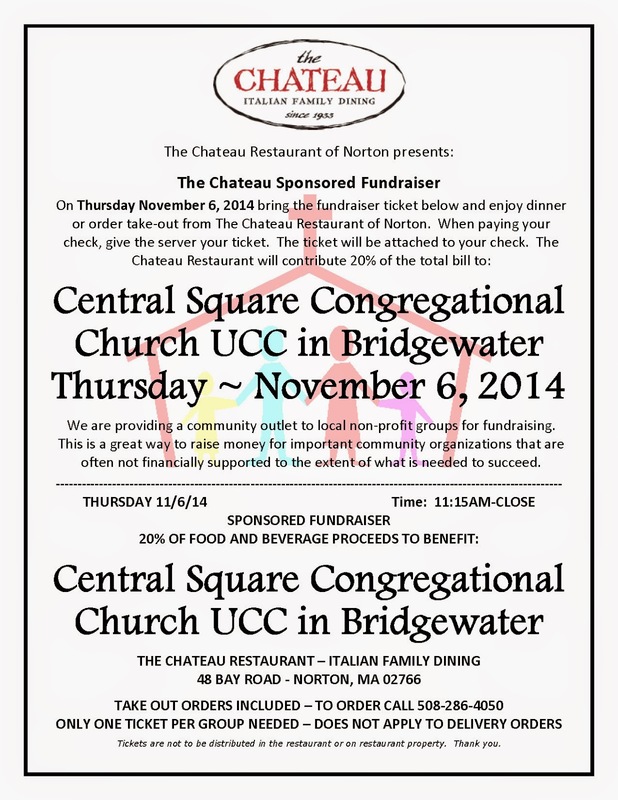 Attached here is a flyer from The Chateau Restaurant in Norton. This THURSDAY, NOVEMBER 6, Central Square Congregational Church will sponsor a fundraiser for anyone willing to make purchases at The Chateau, AND who brings in the flyer with them. (Just click on the attached flyer and print it out!) In return, The Chateau will generously donate a portion of sales from the flyers to CSCC. It’s so easy! Just buy anything (takeout or eat-in) from The Chateau from 11am until closing, and present the flyer, and 20% of your purchase will go directly to the church. The flyer can also be found at www.csccucc.com . Please spread the word, and consider having The Chateau for lunch or dinner (or both!) on Thursday! Give these flyers to your friends and neighbors, post it on your Facebook page, Twee and Instagram it out, put a stack of them in your office. And remember, in order for us to get the donation, the flyer must be presented when making your purchase. Thanks in advance! We love being a part of the Bridgewater community.